I continue to muse about evolution in technology. One technology that seems to have stagnated is the means for closure of footwear. Notice that the most common technique for fastening footwear to our feet is a lacing. For thousands of years we have used shoe laces made from a multitude of materials. There is evidence of the use of laces as early as 3500 BC. In the ancient Middle East sandals were the most common footwear. However in the temperate climates laced footwear was used with a more complete covering of the foot. Although the material for the laces has improved from natural materials such as leather thongs or vegetable fibers to fabric laces with improved ends, the same basic use of laces prevails. 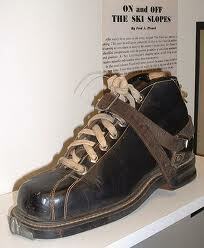 Apparently in 1790 the modern shoe lacing procedure was invented in England as a replacement for shoe buckles. Native peoples, however, consistently used a moccasin shoe or laced foot coverings. Even though we have invented Velcro closures, the ordinary shoe lace remains dominant for almost all of our footwear. The notable exception in sports equipment is the use of buckles for alpine ski boots. However, it appears that laces still work well for snowboard boots. I am certainly pleased that alpine ski boots have evolved from the leather laced boots I first used in the 1960's. I vividly remember a spring ski day at Mad River Glen in the 60's when my leather laced boots were saturated with water and no amount of lace tightening would give me any reasonable control of my skis. Fortunately that was my last day with laced leather ski boots. New plastic boots with adjustable buckle enclosures became the normal boot for the future ski days. I wonder what other technologies have prevailed as long as shoe laces. Does anyone have any suggestions?